To register for a GroundShare Arts class or Summer Camp, please email your request to amanda@groundsharearts.com. …all flow and flourish through interconnected, project-based, self-propelled learning. Rooted and inspired by Nature and expressed through various art mediums, your child will have ample opportunities to both learn from surrounding Nature and work with professional teaching artists who will come along side their expressive process. 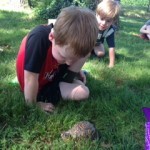 The creek, streams, and woods of Glen Carlyn Park offer enriched outdoor classrooms to explore and drive inspiration. Throughout the week, we weave a sense of reciprocity and stewardship towards Earth with activities that express gratitude and respect for our shared planet. Time: 9:00 am – 2:00 pm. There is a cumulative performance on Friday July 13 (full moon) at 1:15p.m. Price: $365; Materials included; Please pack a snack/lunch. To register for this class, please email your request to amanda@groundsharearts.com. GroundShare Dance Theatre is a performing company of young artists and professional teaching artists steeped in the tradition of American Modern Dance. Our dance theatre company is a full year commitment designed to provide students, not only with a strong technical grounding, but guide them through the process of creating and choreographing original works of dance theatre. 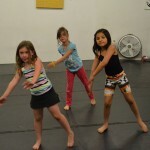 As a company of all ages, our performers create and dance together, connecting as an ensemble while bringing an individual and unique expression of self to the group experience. Location: Barcroft Community House: 800 S Buchanan St Arlington VA 22204. Time: Tuesdays, 4:45 – 6:00. September 27 – May 30. Location: Greater Washington Dance Center, Reston VA.
Time: Sundays, 10:30 – 11:30. October 16 – June 4. Time: Sundays, 9:00 – 10:00. This class is designed to introduce the young artist to the world of dance through imagery, storytelling, props and music. Dance is explored while concentrating on age appropriate developmental skills, beginning dance vocabulary, and creative exploration. This multi-sensory class will engage students in exploration of the world around them while introducing the fundamentals of dance technique. This fundamental class will allow the dancer to explore the dynamics of movement and their bodies as a tool for self-expression. This class is designed to develop the emergent dancer while engaging their creative impulse. Modern Dance I will teach class etiquette, beginning dance techniques and creative exploration while providing a safe and structured environment to develop as a mover. Dancers should come to class bare foot in a leotard and footless tights or fitted t-shirt and dance pants or shorts.